Amie Taylor is a 9th grade algebra teacher. She’s also a CrossFitter. 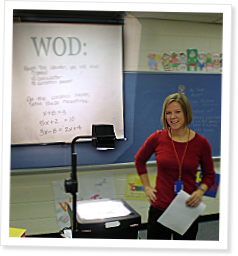 This past summer, I was sitting in a “how to be a better teacher” training seminar, daydreaming about what WOD I was going to do that day and how fast could I get to my box. Then I had an epiphany. I knew how CrossFit made me feel and why I loved it. So I wondered: is there a way to bring the methodology of CrossFit to my classroom and give my students a taste of the Kool-Aid? Now, the warm-up activity is called the “WOD.” We do a series of benchmark drills - math skills that we drill over and over - called Fran (the 9x9 multiplication table), Monica (the 12x12 multiplication table), Tam (10 equations, solve for x), and Grace (30 integer problems). Josh is our version of CFT, Laura our highest test grade. The best times and scores are posted on a white board; students often bring their friends by to show them. “Look, I made it on to the white board!” The kids each have a PR chart to track their benchmark times, so they see for themselves that they are learning, building better skills, and achieving success in a subject they all used to hate - and are now learning to love. Welcome to CrossFit Algebra in Arlington, Texas - the first math class to apply the methodology of CrossFit. This article is only available to subscribers. Please login or subscribe to download. There are 13 comments on this article. Login to add your own. This is the first part of a complete training session that Vilma Siebers, 81, had with Jim Baker at CrossFit Santa Cruz Central, where he is a trainer and co-owner. This is the second part of a complete training session that Vilma Siebers, 81, had with Jim Baker at CrossFit Santa Cruz Central, where he is a trainer and co-owner. After an incredible transformation of her body and mind, Stephanie Vincent has become a Level 1 trainer and has suggestions on how to coach the unfit. Affiliate owners share how they’re tailoring their approaches to introduce Baby Boomers to CrossFit. What an incredible, inspiring story! Amie, I am so proud of everything you have accomplished with these kids. You have made such a huge impact on them at such a pivotal moment in their lives. Good luck in all your future applications of Crossfit, and our garage is always open if you need a WOD partner! You wrote a great article. You were able to verbalize something that I haven't been able to put my finger on. My wife still thinks I'm crazy. I was introduced to CrossFit in 2006 while I was stationed in Korea. I was coming off a major foot surgery. After my first workout I was hooked. Eventually I was able to do a muscle up. In March 2008, the bottom fell out. I suffered from spontaneous nerve palsy in my left shoulder resulting in a completely frozen shoulder. I'm now back to about 95% motion. My right foot also suffered the same fate as my left foot from three years prior. I had surgery on my right foot in September. Through all this, even though I can't "CrossFit," I do what I can and CrossFit gives me the drive an hope to recover. Thanks again for that inspirational story. I thought this was a great idea before I read the article. Now that I've read it, I'm seeing how I can completely revolutionize my business — and I mean, completely. I'm bringing all the ideas I learned at my Level 1 cert and seeing how they can apply to my field... oh man, I'm so excited, I'm going crazy. I just spent 15 minutes brainstorming ideas, and I'm totally pumped about how this is going to work. More soon, I promise! And thanks, Amie, for the awesome Christmas present! Thank you to all for the kind words!!!! You two are the best! I look forward to many more WODs in your garage, pullups, burpees, five minute metcons and the rest :) And as much as I love the WODs, I appreciate your friendship even more - you two are solid. WOW! I'm excited to hear about your ideas! Keep us posted on your business! I'm convinced CrossFitters can do ANYTHING. Great article, truly inspiring. It's so nice to hear about a teacher who truiy cares, and doesn't give up on the "tough kids". I only wish I could've had a teacher like you. High school for me was boring as ever. wow!!! aime taylor is a TEACHER!!! she is also the daughter of a MARINE!!! she is a CROSS-FITTER!!!! this young lady is awesome!! OUTSTANDING job ms aime!!! Way to go, Aime! What a great idea! I wish I had a Crossfit teacher when I was struggling with high school algrbra. In fact, I wish I had Crossfit coaches in high school sports. Thanks to the Glassmans, and all the Crossfit coaches for bringing us this wonderful methodology, and to innovators like Aime, who show us that the methodology can be applied ,with success, to all facets of life (across broad modal domains). Amie, your article was every bit as inspiring as watching a sub two minute Fran video! Kudos to you for transforming your classroom and to your school for allowing you that kind of freedom. Best wishes for the new year; I hope your kids know what a great teacher they have. I can't wait to try it. I love the idea of getting students to compete against themselves while increasing brain plasticity. Thank you for the inspiration Aime. I blogged about this article on my blog here and just got an email from a member of our state school board. I don't know why she wants to talk to me. She should talk to Amie! Kudos to Amie for being a desperately needed leader in today's public schools. What a wonderful article and a very inspirational story! You are changing those students' lives for years to come. While I wasn't someone that was bad at math, I never did enjoy it, but your class sounds like FUN! To answer your challenge from the article, as a classically trained professional musician (oboe) I have found the CrossFit has given me a focus in my practice and performance that I never had before and has really made me a stronger performer. CrossFit is applicable to ALL aspects of life. Thanks for demonstrating that in a real way! Amie, thanks for the great article. My 12 y.o. son is a homeschooler, and started algebra after Christmas break this year. He's good at it, but says he "hates math" since starting algebra. He's really not fond of handwriting in general, so having to write out the longer problems he's encountering in this subject is the main frustration for him. Maybe I can use some of your ideas to get him excited about algebra. It would be great, too, if I could come up with a way for him to get excited about his writing assignments! Just to let you know, I couldn't resist trying your version of Fran. My time was 2:13:23. I just got whipped by a 9th grader (probably a classroom full of them, lol)! That's a great teaching method. Thumb up for interactive leasson! With my students, they have prooved exceptionally effective. The CrossFit Journal is a chronicle of the empirically driven, clinically tested, and community developed CrossFit program. Our mission is to provide a venue for contributing coaches, trainers, athletes, and researchers to ponder, study, debate, and define fitness and collectively advance the art and science of optimizing human performance. for questions or problems with your CrossFit Journal subscription. Subscribe to get updates to the CrossFit Journal by email. Copyright © 2019 CrossFit, Inc. All Rights Reserved. CrossFit is a registered trademark ® of CrossFit, Inc.